I consider myself pretty skilled at car karaoke. When a song like Queen’s Bohemian Rhapsody comes on my iPod or the radio, there is no stopping me from belting it out just like Wayne & Garth in Wayne’s World. I took a year of choir in 6th grade, and I took piano for about 6 months at age 8 until my instructor made me cry. That was the end of that, and my musical talents haven’t developed any further since. Some people got a heck of a lot more musical know-how than I did. One of those is Christoper Bridges, better known by his stage name Ludacris. The 37-year-old has had a wildly successful career in the entertainment industry, centered largely around his rap music. 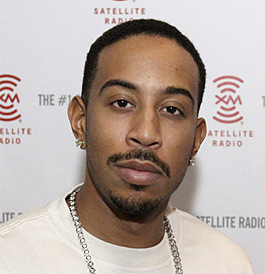 Ludacris has published 8 albums since his first in 1999 and has soared to the top of the billboard charts plenty of times. His film career is nothing short of successful, too, having appeared in 18 movies including four Fast & Furious movies. 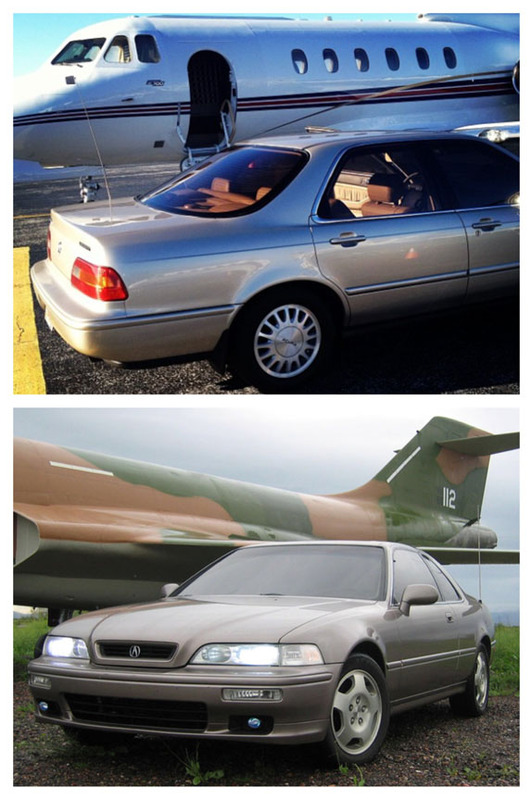 But speaking of fast and furious, did you know that Luda’s automotive tastes align very closely with many of ours? I present to you the album cover for his 9th and latest record, set to debut on March 31. 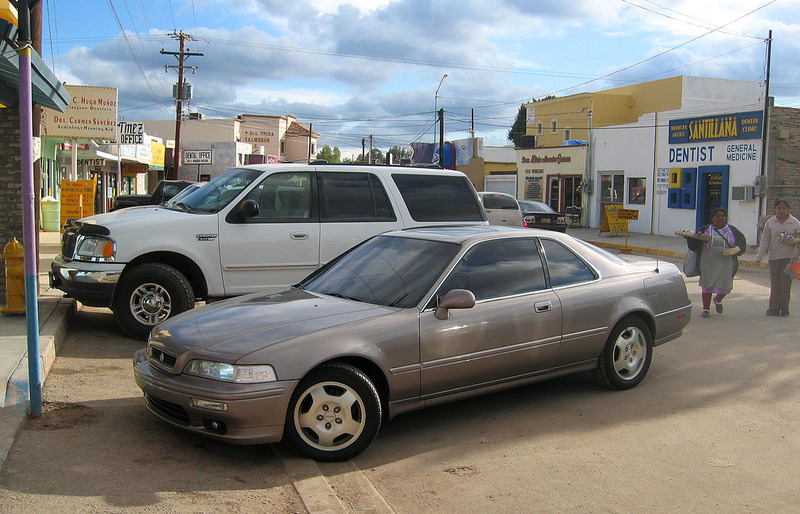 We are looking at a Cashmere Silver Metallic 1993 Acura Legend LS sedan. Ludacris has proudly owned this car since the early days of his career, and to this day it’s his favorite automobile. 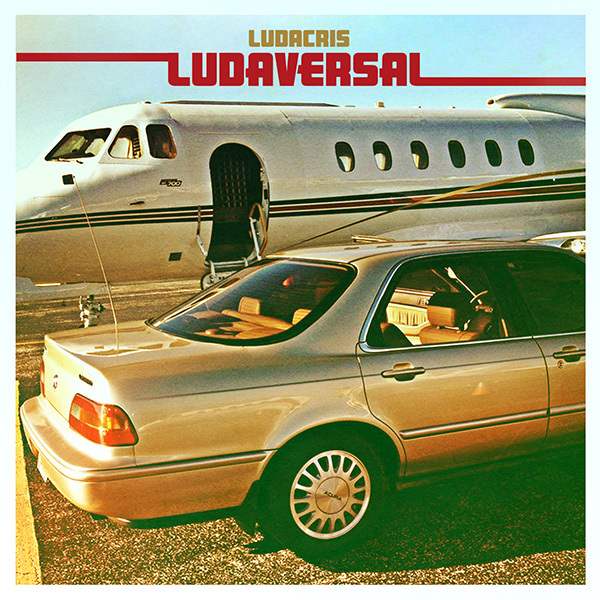 The album cover – entitled “Ludaversal” – also features Ludacris’ private jet. I find it pretty awesome that a guy with 20 million Facebook followers and countless other fans is staying true to his trusted old Legend. Luda talked about his Legend on the Ellen show last year. “It’s one of those things I will never get rid of,” he said. Sounds like Ludacris and I have quite a bit in common! Especially since he notes in the video that his car has over 250,000 miles on it. Here’s a short video clip capturing those comments. Hey Luda, you’re only halfway broken in. And check this out – great minds must really think alike because I have a picture of my Legend with an airplane, too. Different settings but same idea! “My” version of the Legend-airplane shot was taken just a little over 10 years ago, in February 2005 during one of my first road trips through Arizona. My grandma and I had driven to Phoenix from Southern Utah to visit my great-aunt who was receiving care at one of the hospitals there. Grandma flew back to Utah, but I continued my big road trip by making my way toward sunny (or rainy, rather) San Diego. These shots was taken in Gila Bend, Arizona. In the spirit of a little throwback, since it’s Thursday after all, here are a few other shots from that same trip. 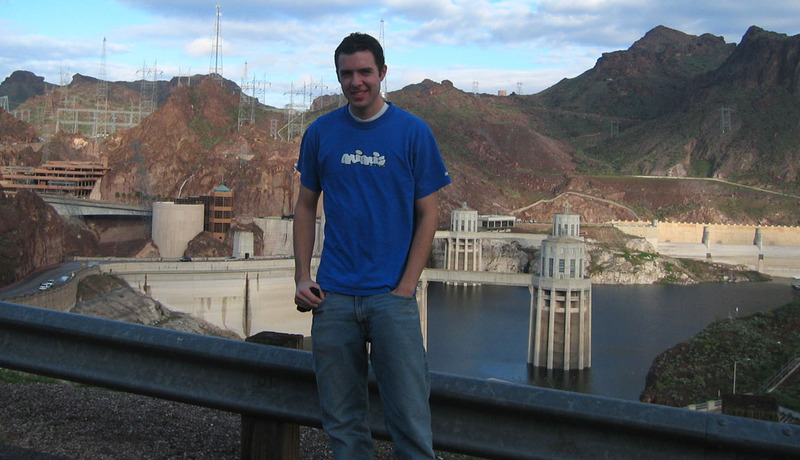 First of all, here’s my skinny self at Hoover Dam just outside Las Vegas, Nevada on Highway 93. This was back in the day when the highway traffic used to actually pass over the dam. Today, a multi-lane bypass bridge carries traffic across the ravine a little bit downstream (and cuts travel time by about 20 minutes in the process). 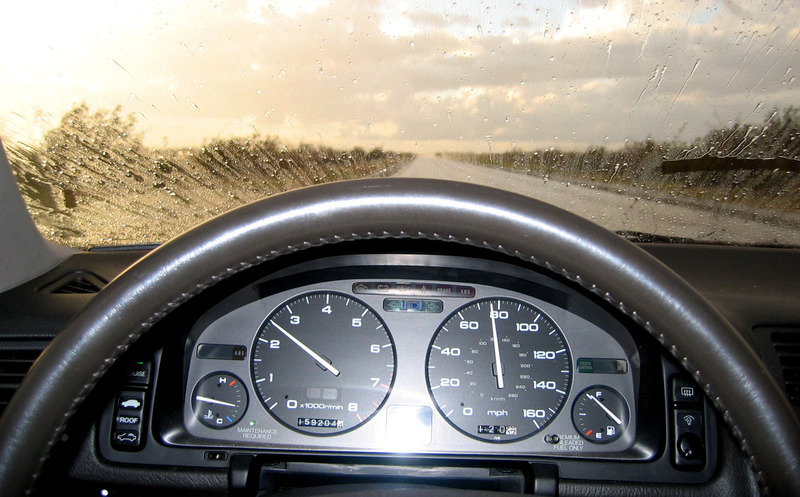 Rain on Interstate 8, and my (only) 159,000 mile odometer reading. Stopping in Algodones, Sonora, Mexico for a quick drive-through. I was really going out on a limb here: No passport, no Mexican insurance policy, and no prior knowledge of how to find my way around town. Morning shot at the pier in Oceanside, California. 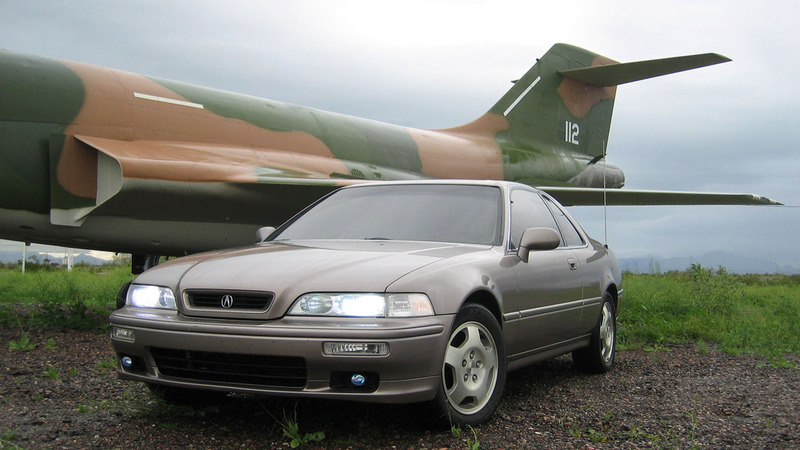 Lastly – Check out this high-mile Legend! (thanks Scott for the tip). It’s sitting at 392,924 miles and for sale currently on Ebay. 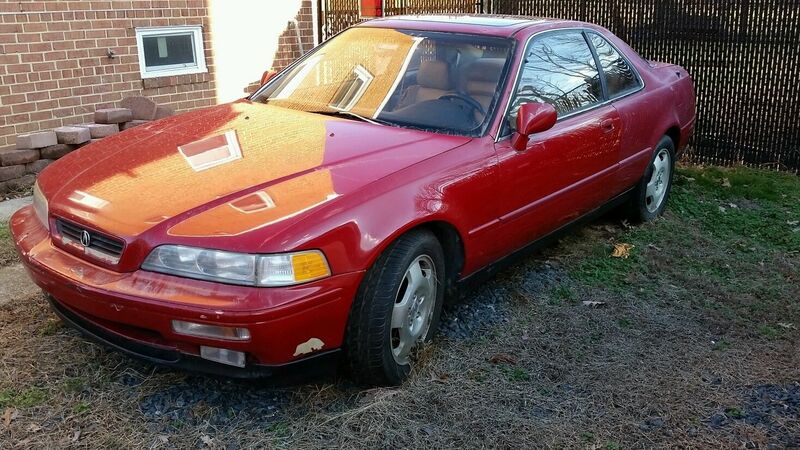 Though, it doesn’t have the original engine, and cosmetically it’s looking quite ragged. Still, it’s nice to see another Legend that has covered some distance. Yikes! Who let the grizzly bears get in there? This entry was posted on March 5, 2015 at 6:45 am and is filed under Legend, Throwback. You can follow any responses to this entry through the RSS 2.0 feed. You can leave a response, or trackback from your own site. I think it’s hilarious how odd people outside of our circle of “crazies” think we are. Sit on it Ellen! Great write-up as always Ty! Haha, right on! Some people just don’t understand it! I got a kick out of the Ellen clip. Hope your week is going well, Dave. Btw, NALM 15 location & date announcement is forthcoming on Saturday. Haha. Okay WHEN I get one, I’ll take a Granada Black Pearl 6-speed sedan. That should be a challenge to find! Wow, major respect to Ludacris for keeping his Legend for so long! And judging by the condition of his car, I would not be surprised to see his car pass 500,000 miles. And as for that high-mile Legend on Ebay, if it was near Salt Lake City I would maybe consider picking it up as a summer project. 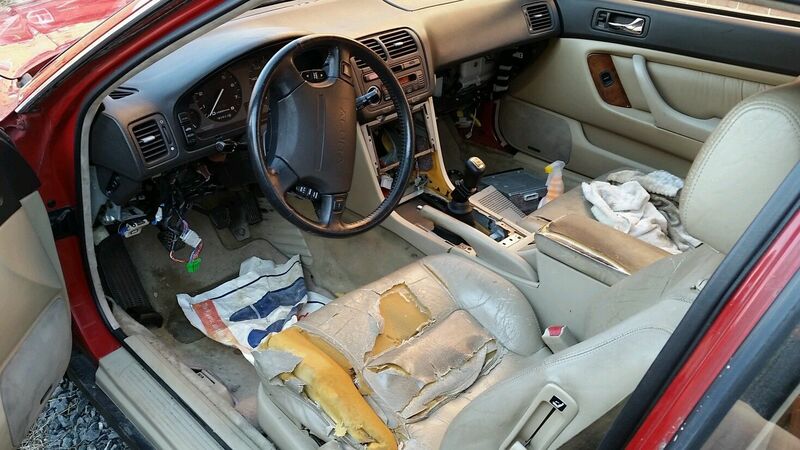 Of course it would be a lot of work to get that thing back together internally and cosmetically. Yeah, that red 1993 needs a bit too much work. 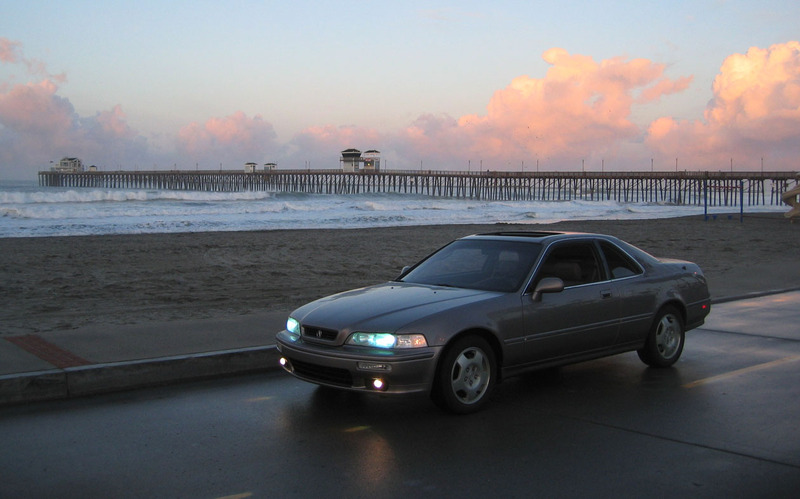 It might make a nice parts car — the drivetrain is definitely worth something since 6-speed parts are tough to come by. I’ll keep eyes and ears open for a good Legend for ya! Hope your week is going well.